Easy to use colored granulated wax. 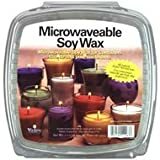 5 lb bags of granulated wax (unscented), (8)9oz hexagon jars with lids & 10 wicks to make your own unique and colorful candles. Make 12 Unique and colorful candles.